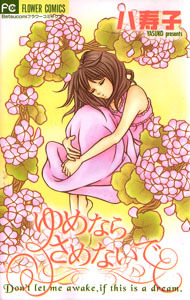 Here is one of two summaries of manga by Yasuko that I am adding today. I really like her style for some reason. I am not exactly sure why. This volume contains three one-shot stories. The first one is my favorite, but the others are really good, too. The first story begins with a horrible accident. Well,lets take a step back, actually. High school girl Sachika and her friends are having a great day at an amusement park. Things get better, when the boy she likes, Tetsuo, confesses to her that he likes her, and they become an official couple. Sachika couldn’t be happier! She and Tetsuo are so happy, and promise to always be together. Things don’t always turn out as planned. Sachika gets into an unfortunate accident one day when, right before Tetsuo’s eyes, she is struck by a car. The next thing Sachika knows, she is waking up in the hospital with a strange man next to her. He introduces himself as KOHARA Takeshi, and he claims to be a distant relative and informs Sachika she has been in a coma for a month! Sachika is confused. Where is Tetsuo? Where is her family?! Takeshi tells her that from now on, she will be staying with him. Her faimly has left her in his care. He takes her to his apartment, where Sachika spends several confused days. Something isn’t right! Tetsuo said he would always be with her! What is Takeshi hiding from her?! Is that Tetsuo with another girl?! The next story is a complicated and tragic gender-bending reincarnation story. School girl Hisa-chan dreams of finding her destined ‘darling’, but never imagines that it could possibly be her new classmate, Ran! One day Hisa, who is afraid of storms, is caught in the rain. A handsome stranger offers her an umbrella, and Hisa is smitten. He is so handsome, he MUST be the one! He feels something too. In fact, Hisa gets a strange feeling around him, and she begins to have dreams that are set in a distant time, when she is a cute young bride who has a cute, young husband. Could this be some sort of past life? Hisa gets a huge shock the next day when the stranger with the umbrella turns out to be her new classmate, Ran. And Ran is…. a girl! Sure enough, Ran and Hisa were once involved in a set of tragic past events that have come full circle…. Finally, we have the story of a very lively and tough girl named Mitsuki. She has been recently dumped by her boyfriend who had a hard time seeing her as a girl. She just doesn’t act very feminine. This makes Mitsuki really upset. Fortunately, she has someone beside her that she can vent all her anger and frustration to. His name is Kengorou, and he is Mitsuki’s childhood friend. He is also kinda cute and wears glasses, and is a shoujo mangaka! Mitsuki thinks Kengorou has a better grasp on how to be feminine than she does, so she asks him to help her be more like one of the girls in the shoujo manga he draws!